The blogosphere is full of satire and just flat-out lies which prompts me to double check information I encounter especially when it is "too good to be true". Fortunately, I came across Nuffnang and it proves to be a reputable source to this day. Becoming a part of Nuffnang community makes me happy. It’s a safe site in which hundreds of other people around the world share interests and participate in. Joining Nuffnang is one of the best things that I have ever done in this online world. And I'm keeping my fingers crossed to stash a pair of tickets to the block screening of Cowboys And Aliens, starring Daniel Craig and Harrison Ford! This is one hot movie that I will surely look forward to! 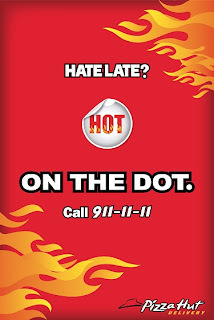 Talking about hot, did you know that Pizza Hut now offers Hot on the Dot Pizza deliveries? I love Pizza Hut. Your pizza will be delivered in 30 minutes AND hot (as indicated by the thermally activated sticker you place on the pizza box upon receiving your pizza) or your pizza is FREE! My family and I love Pizza Hut. I suggest you try out their delivery and maybe get a FREE pizza in return! 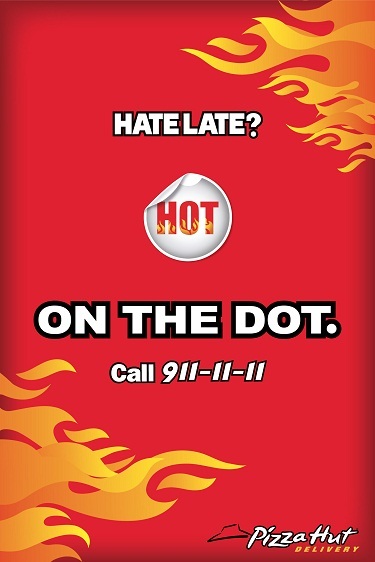 You just have to dial 911-11-11 if you want your pizzas Hot on the Dot!